Post inspired from Corina at Not So Busy Moms. It is always good to enjoy your work no matter how hard it may seem. But with home-based answering service, you can enjoy your work even without experiencing hardships. The most inexpensive and easiest way to start this answering service business is to have a separate phone or phone line for each client that you are working with. Then, you will mark every single phone with the name of the company you work with as an identifier for yourself if the phone starts to ring. Having a separate phone lines will run more or less $200 each. At the same time, you are going to pay for the monthly charges for every phone that you are using for this home business that you have. This is typically $35-50 every month. Whenever you are about to buy actual telephones, you can get these at very inexpensive prices at the local stores near you. So far, this is the best option that you have if you want to work with less than 10 businesses. On the other hand, if you want to work on more than ten businesses, you can lease a switchboard from a local telephone company for your answering service business. By doing this action, this is going to make your operation space effective. This switchboard will be able to accommodate the number of business that you intend to work for you. Before you sign up with a contact on the business that you want to work with and before you buy any phone, you need to check with the telephone company so you can check out how far you will be able to go in this business. There are chances when there can be a limit for your residential neighborhood. You also need to know how many customers you will be able to work with and this will also depend on the number of lines that you will install. You can consider opening a home office near a commercial area where you can have as many number of lines that you need so you will be able to accommodate all of your clients for the answering service. The type and amount of equipment that you will get will be based on your budget and your goal as well. This could be as simple as an individual telephone lines or as complicated as the computer screens which flashes some messages or record instructions that you need to deal with. If you have a more advance equipment, the more money you need to spend. If you have money amounting of $25,000, you will be able to get a switchboard that has 25 lines and a trunk line cable from your phone company. It is already given that if you are able to work with more business, the greater the reward you will get. This is in fact something that you need to decide for yourself. If this answering service is just an extra business that you want to do, you can work with one or two clients to maximize your time. Meanwhile, if this is a new career for you, you can consider having a bigger investment in handling calls. Interested in learning more? 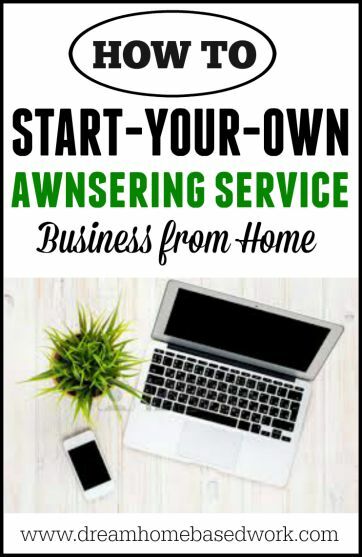 Check out this list of home business ideas where you can discover more ways to become your own boss! I have an answering service and I uses affordable to software much cheaper than buying phone lines. I uses Nectar Desk but their are others like Five9, Jive, etc.